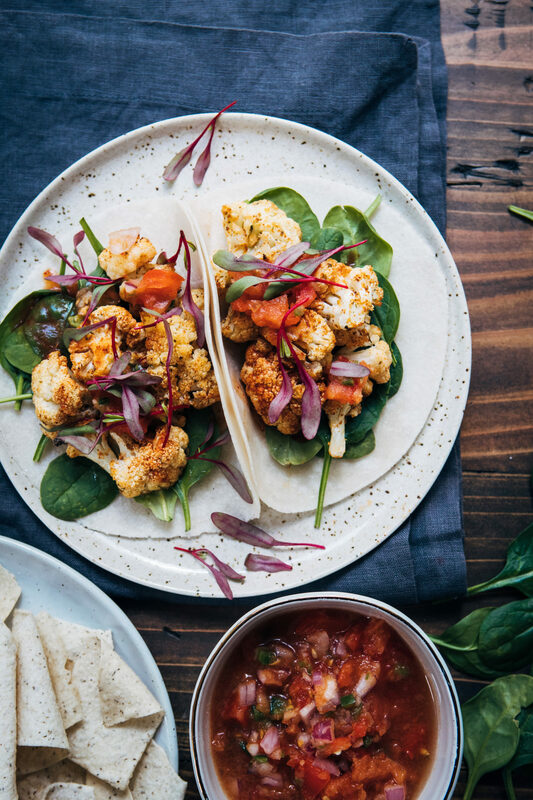 These Spicy Vegan Cauliflower Tacos are bursting with plant-based flavor, with roasted cauliflower and homemade pico de gallo. 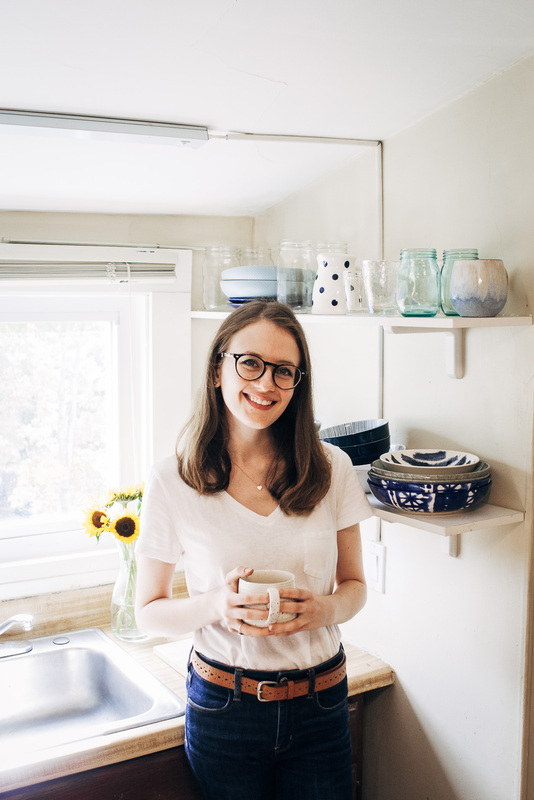 Once the warm weather hits, I CRAVE Mexican and Southwest-inspired food. 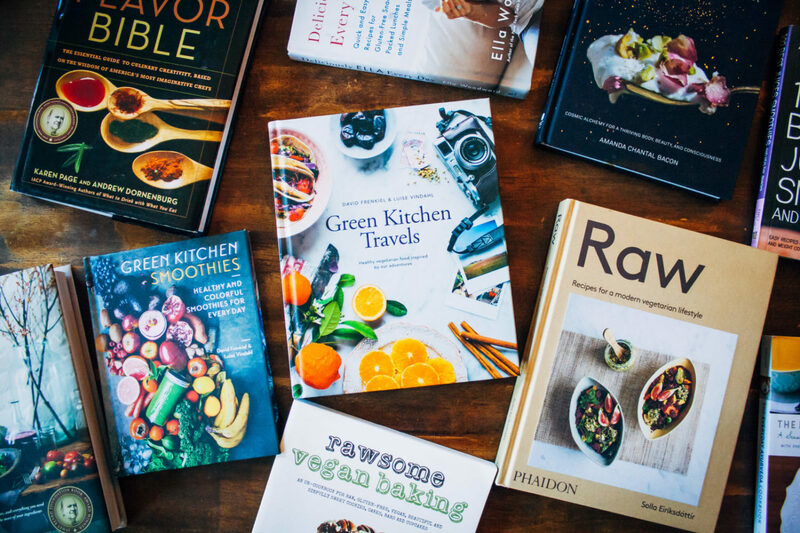 Gone are my huge bowls of pasta and stir-fries – bring on the salads, tacos, burritos, and fajitas. These spicy vegan cauliflower tacos are exactly the type of food I want to be eating when it’s warm – fresh, easy, and delicious. If you like these tacos, also check out my buffalo cauliflower tacos or spicy vegan burrito bowl! My fiancé and I bought our first home together a few months ago, and things have been really nice here. Before, we lived in the city, and I didn’t really like it there. We lived on a busy street and there were always cars zooming by at high speed. There was trash and broken glass all over the sidewalks, and I had to get packages delivered to my parents’ house because they would get stolen from our front porch. But now we’re happy in a smaller town, ensconced in suburbia (which sounds humdrum but I LOVE it). Our neighborhood is quiet and safe. I can take Ivy on walks down the street and the only distraction is a smile and a wave from our neighbors. I feel so incredibly lucky and privileged that we’re able to live here, and I don’t take it for granted for a single second. Just yesterday my fiancé and I went to Home Depot and bought some plants for our gardens. I’m SO excited to finally have my own garden and to grow some beautiful plants. We’re growing a bunch of herbs and vegetables from seeds (lettuce, kale, jalapeños, red onion, basil, etc)., but I also bought a forsythia bush and some blueberry bushes. I can’t wait to plant them!! I hope this doesn’t all sound like I’m boasting about my life. I still am fighting a serious battle right now with mental health issues, so things aren’t perfect. But after moving eight times in three years, I am SO grateful and happy to finally be putting down roots. These spicy vegan cauliflower tacos are bursting with flavor, with roasted cauliflower and homemade pico de gallo. Any other toppings you'd like! Cut your cauliflower into bite-sized florets. In a bowl, toss the florets with a drizzle of neutral vegetable oil, salt, and spices, until cauliflower is evenly coated. On a baking sheet lined with parchment paper, roasted cauliflower in the oven for about 25 minutes, or until tender but slightly browned. While the cauliflower is cooking, make the pico. First, cut the jalapeño in half and remove the ribs and seeds. Then, dice the jalapeño, tomatoes, and red onion. 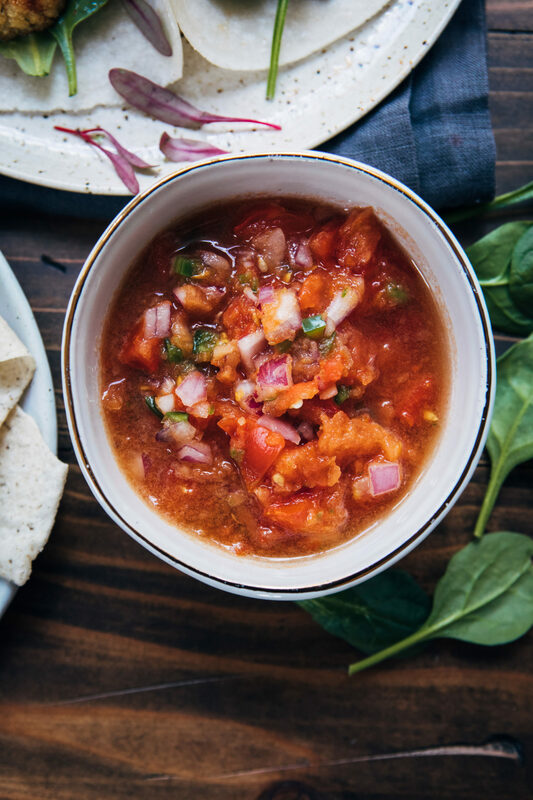 Mix all of the pico ingredients in a bowl and let rest for at LEAST 10 minutes. Taste, and adjust seasonings if necessary. When cauliflower is done, remove from the oven and let cool slightly. If you don't have chipotle chili powder for the cauliflower, sub with regular chili powder. Yum! I want this now! Hi Sarah! 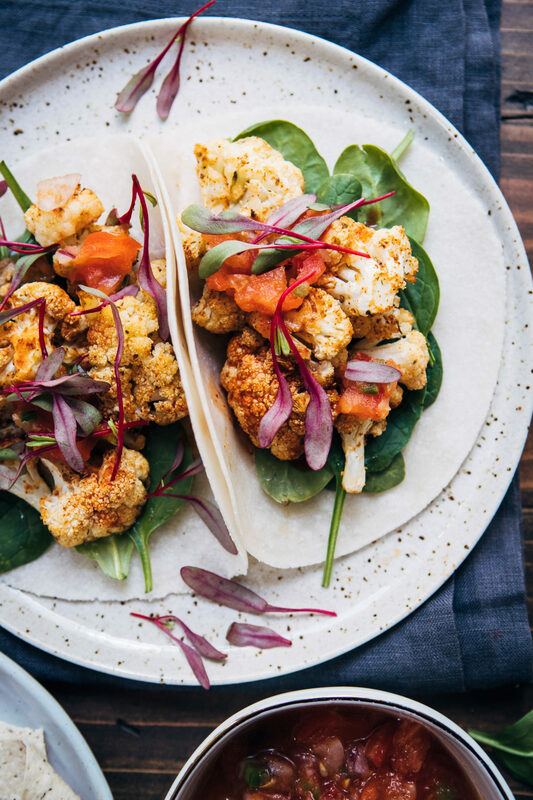 These cauliflower tacos sound and look delicious! Just being happier in you new place will make things even better! Your tacos looks so delicious! I love Mexican food and pico de gallo :) In fact, we had veggie tostadas for lunch today :D (with feta cheese for the boyfriend and tons of guacamole for me). I sometimes have uncontrollable cravings for Mexican food, so I fully understand ;) And I’m so jealous of your weather. Here in Poland the temperature was down to about 40F this morning–positively freezing. Veggie tostadas sound delicious, I should make a recipe for that! :) And it means a lot to have moral support from random people on the internet ;) Feeling like I have a community and friends here helps me so much!! Thank you!! :) I hope you like the recipe! Thank you!! :) I could always use more tacos in my life too LOL! !